What is EMDR and How Can It Help Me Heal? 29 Sep What is EMDR and How Can It Help Me Heal? 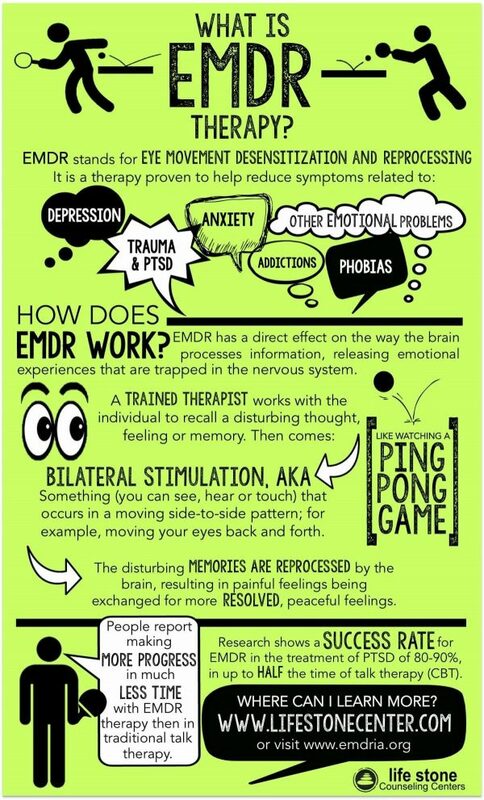 What is EMDR & how can it help me? EMDR stands for eye movement desensitization and reprocessing. It is a therapy proven to heal people heal from PTSD, traumatic memories, fears, phobias, anxieties, addictions, and relationship difficulties (affairs, divorce, breakups). EMDR is administered by a trained, licensed therapist. What happens to the brain when it’s “stuck” in trauma mode? Many clients come into my office and tell me that they feel stuck and unable to move forward after a traumatic event in their life. When this happens, the brain’s adaptive information processing network – think of it like the brain’s computer system – stops working the way it should, and gets stuck in fight, flight or freeze mode. To a client, this state may feel like repetitive thought patterns that lead to rapid heart rate, shallow breathing, anxiety, or fear every time they are triggered by a negative event in their life. All of the times they have felt fear in their life, from childhood through adulthood, get stored in one memory channel or network in the brain. Each time a similar circumstance activates the nervous system, it sends the person into the same fight-flight-freeze response. In the brain, this is when the the amygdala, or emotional control center, is activated in order to help the person escape the traumatic situation. Sometimes so much cortisol (stress hormone) is released that the nervous system responds by freezing up, and the trauma is locked away in the body and mind. EMDR releases that trauma to help the client move forward in life without being triggered by negative events. In order to help the different parts of the brain communicate with each other and integrate various traumas, EMDR uses pulsars or a sound to achieve bilateral stimulation. These pulsars or sounds alternate from left to right, at a speed and intensity chosen by the client, to integrate the left and right sides of the brain. This integration allows the sides of the brain to communicate more effectively and process traumatic information that was stored in the nervous system. These disturbing memories are reprocessed to exchange painful feelings for resolved, peaceful ones. This reprocessing helps clients to feel more peaceful and move forward successfully in life and relationships. What happens in the brain during and after EMDR? MRIs show the effects of EMDR and how it restores proper functioning of the various parts of the brain. In terms of brain functioning, the adaptive information processing network starts to function as it should, by “turning on” areas of the brain like the hippocampus and frontal cortex. EMDR’s success rate in the treatment of trauma is 80-90%, compared to traditional talk therapy’s 40-50% success rate over a longer period of time. EMDR therapy has also been used to prevent dementia and other diseases associated with cognitive degeneration. To learn more about EMDR and how it can heal, please see frequently asked questions addressed here, or contact me today for a free 15-minute consultation.